Barking and howling is one way that dogs communicate with their owners as well as send messages to other dogs in the vicinity. But one husky puppy's first attempt at letting out a huge bark turned out less than overwhelming. The adorable husky puppy looked around the room nervously before opening his mouth as wide as possible to let out what he hoped would be a sound worth reckoning with. What this tiny fellow was able to muster at his tender young age, however, proved to be more hilarious than horrifying. When the determined husky puppy attempted to let out a full-force howl, what escaped from his adorable mouth was a rather funny high pitched yelp instead. His human owner holding the puppy securely in hand continued to stroke the puppy, encouraging it to continue to practice its fledgling ability to howl at the moon. After a few initial soft yips, the husky puppy mustered all of its strength, opened its mouth wide, and delivered a puppy-size yelp that proved less than underwhelming. 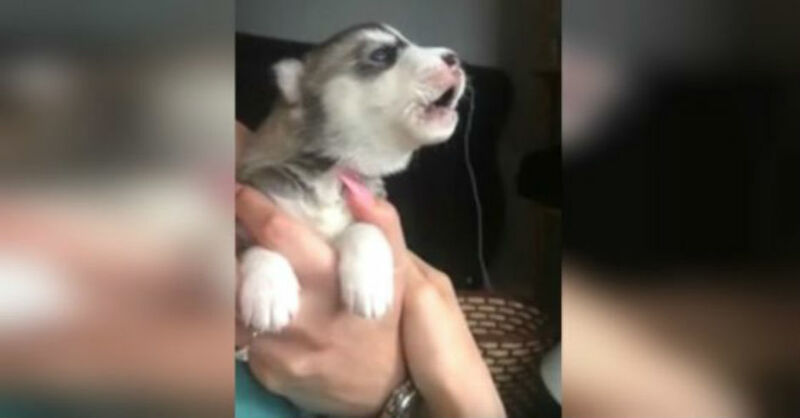 The puppy's first attempt to howl was recorded on film, no doubt so that his proud owner will be able to compare the dog's deep and thunderous howl once he is an adult to his hilarious first attempt to announce to the world, I am husky puppy, hear me howl!